Posted on September 28, 2008 at 1:08 am, under sociology 101. This is a scene from HBO’s new show True Blood. Apparently, it’s pretty racist and sexist but man do I have to watch me some more just for more Tara scenes. She is pretty kickass. Posted on September 27, 2008 at 5:01 pm, under music talk, thinking out loud. Posted on September 27, 2008 at 4:44 pm, under fashion, lifestyle. I buy too many tote/canvas bags even though they never fit enough of what I need to bring with me every day. I bought this one from Strand Bookstores the other day. 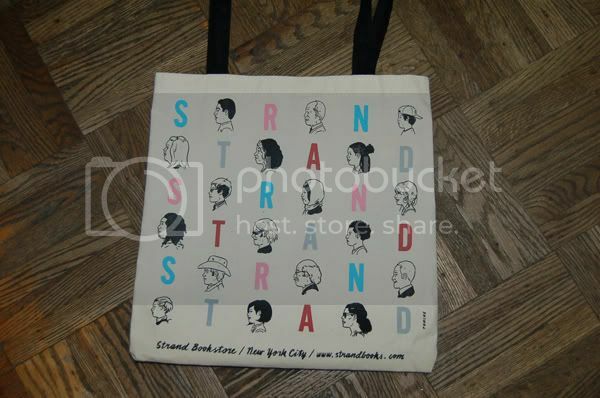 I’ve always like the simple designs on Strand’s bags but I think they recently came out with a few special editions of their bags. My particular one is done by Adrian Tomine, who is a graphic novelist. Pretty cool stuff. Posted on September 26, 2008 at 2:50 am, under asian pop, music talk. Gorgeous song. Great piano background, easy-to-listen-to vocals, the most moving acappella ending. Posted on September 20, 2008 at 12:55 am, under asian pop. Kim Rae Won was in the first K-drama I ever watched so him and I go waaay back (ahem). And now that I’ve picked up Gourmet, I’m all over him once again. He also makes me want to cook when I’ve never really picked up cooking before, and that’s kind of important. Because I am learning the techniques to survival all the time, ahem. I actually really like watching him — or just his character, Lee Sung Chan — prepare food more than I like looking at the final product. Of course, the final product is good too, but preparation in cooking makes me excited.